I know it's a couple of weeks late, but this was my entry for Rab's Deadcember contest. It made it in time for that, but the pictures weren't very good so I wanted to retake them. That was also a great opportunity to test out my new Hangar 18 backdrop! The short review on the backdrop is that I love it! I've only used it for one photo session so we'll see how it holds up, so far it looks a lot nicer than the blue gradient I was using. I was skeptical at first, as I grew up with GW using the blue gradient, but I think there is no going back now! Anyway, back to the skull chucker. 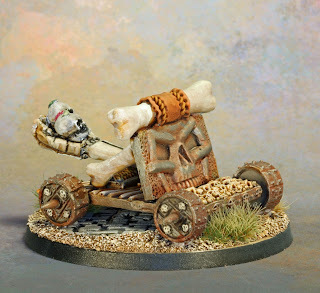 I got this in the Impact Miniatures! 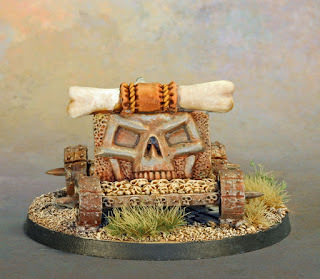 Oldhammer kickstarter. It was originally sculpted by Phil Lewis and Tim Prow (he thinks!) for the now defunct Heartbreaker Miniatures. While the sculpts themselves are fun, I was not terribly happy with the casting. When they arrived, several pieces didn't seem to fit right and the point arm of one of the crew was broken off. Now normally, I would just assume it broke in transit, but the broken arm was in a separate bag, meaning whoever packed it knew it was broken! I also had to cut the axels off the platform and replace them with a thicker piece of wire so that the wheels would actually stay on. 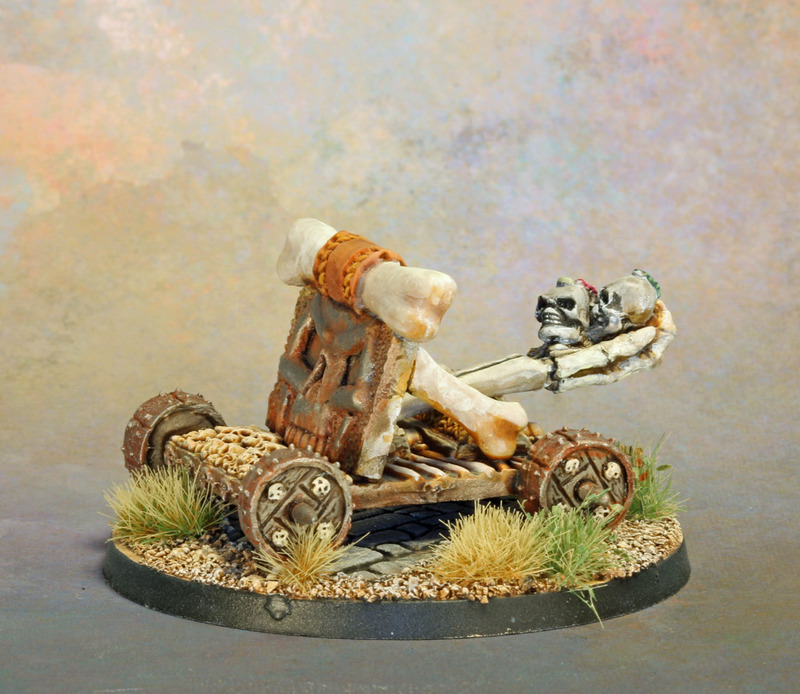 The catapult was pretty easy to paint, lots of rusted metal and bones. I did try to paint the bones drifting towards brown so as to set them apart from the skeletons that crewed it. I didn't want everything to blend to together. To paint the crew, I began by airbrushing the skeletons beginning from dark grey and going to white, each applied more zenithally. 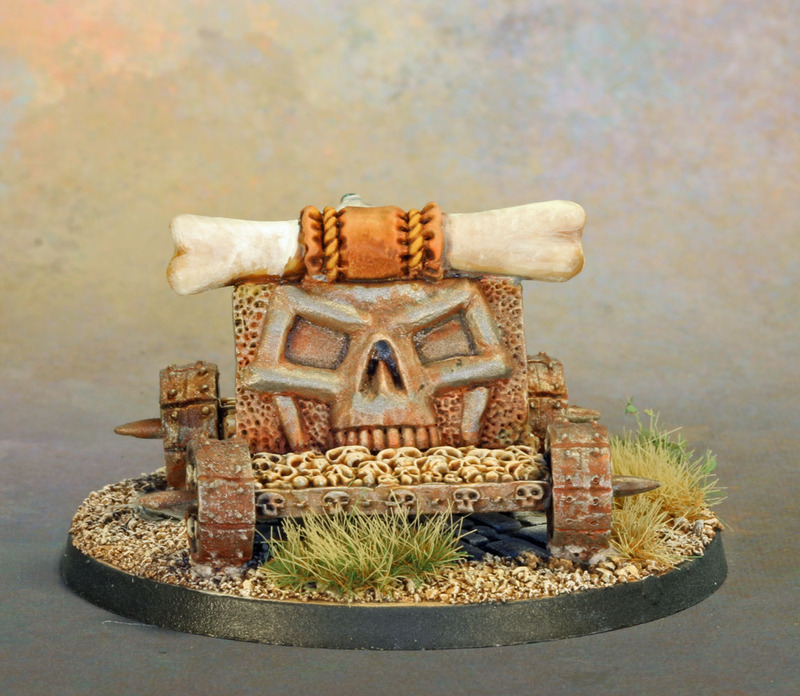 After that was done, I applied some thin glazes of Agrax Earthshade to add a little bit of color to the white and used a black enamel pin wash to get in all the deepest recesses of the bones. Two of the skeletons were pretty much done at this point. But the "leader" of the crew had is armor painted in the same rusty manner as the catapult. For the green cloth, I used Moot Green washed with Athonian Camoshade. The highlights were Moot Green mixed with bleached bone. The shoes were vermin brown and highlighted by mixing in a light flesh color. There may have been a wash in there, I can't remember. And voila, they were done! You just know he has Skeletor's voice! Behold the power of my stick! Very nicely done, and very impressive! I'm very happy with the backdrop, I don't know if it matches my painting style or all models, but I've taken some shots of nurgle marines, sons of Horus, and Anglo-Saxons on it and it matches all of them well. I'm happy to hear that the hapless defenders of Frugelhofen are getting it in the neck once again. Brilliant work. 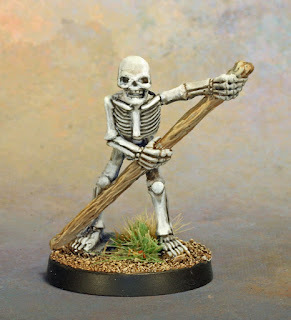 The eternal question for skeletons is do you want them yellowy-brown or greyish-white. I love what you've done with the latter approach - thanks for providing a detailed breakdown of how you did it. Makes me want to repaint all my yellow ones! Literally every time I sit down to paint skeletons I debate whether to go brown or grey. I feel like I'm better with brown, not I like the grey better.